Peter Doyle elected President of Old Crescent RFC for 2018-2019 Season! 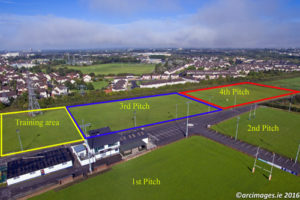 Old Crescent RFC held a well attended AGM in the Clubhouse in Rosbrien on 22nd May last. 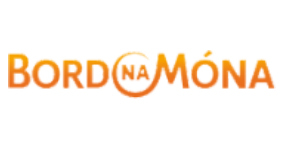 The AGM was preceded by a Mass for deceased members and families, celebrated by Fr Liam O’Connell SJ, which was much appreciated by the families who attended. 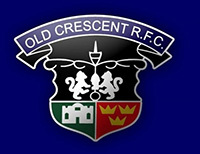 Peter Doyle was elected President of Old Crescent RFC for the coming season. Peter is a long time active member of Old Crescent RFC and a past pupil of Crescent College Comprehensive. 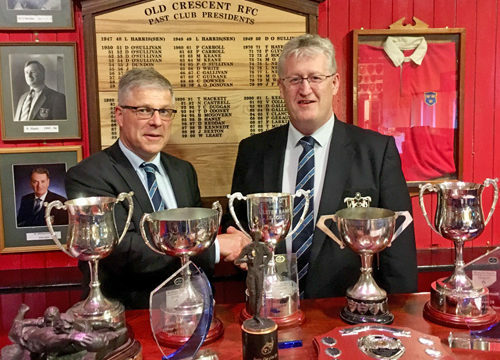 Our picture shows our new President, Peter Doyle, on left, being congratulated on his election by our outgoing President, Tim Duggan, as they stand behind an array of trophies won by Old Crescent RFC in the past season, including the Ulster Bank League Division 2B Trophy. Congratulations, Peter, on your election, and best wishes for a successful season in 2018-19! 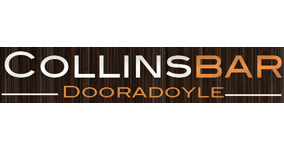 ◂ Old Crescent RFC features on the double in 2018 Ulster Bank League Awards!